The exchange between Leni Robredo and Ferdinand Bongbong Marcos during the vice presidential debate reminds one of something that happened in the past. Sounds familiar and looks familiar. The vice-presidential race is shaping up to be a battle between a brave widow and another mighty Marcos. Talk about history repeating itself. The battle is just for the second post of the land, but in year 2022, the scenario might be another EDSA in the making. In the recent vice presidential debate, a poised Leni asked the young Marcos to return the supposedly billions of dollars stolen by the Marcoses from the Philippines. Marcos said he cannot return what he does not have. Prior to the debate, Leni was already vocal against the vice presidential bid of Marcos. In her most recent interview with Karen Davila, the widow of Jesse Robredo minced no words in agreeing with the statement that the Marcos family should be "perpetually disqualified to run for public office". She reasoned that the magnitude of wealth stolen by them and the human rights abuses committed during the Marcos regime as her reasons for saying so. It is estimated that the ill-gotten wealth of the Marcoses range from $5 billion to $10 billion. Only about P170 billion have been recovered by the Presidential Commission on Good Government (PCGG). Jose Luis "Chito" Gascon, Chairman of the Human Rights Commission says there were about 200000 victims during Martial Law. The older Ferdinand Marcos placed the country under Martial Law on September 21, 1972 and lifted it only on January 17, 1981. In the latest ABS-CBN Pre-Electoral National Survey conducted by Pulse Asia Research Inc. from March 29 to April 3, Bongbong topped the race with 28% followed by Leni at 22% and by Chiz Escudero (21%). It should be noted that the survey was done a week before the vice presidential debate, where a lot of netizens praised Robredo and Alan Peter Cayetano for their debating skills. A Social Weather Stations (SWS) survey conducted at almost the same time (from March 30 to April 2) also showed Bongbong leading at 26%. He is followed by Escudero at 21% and by Robredo at 19%. However, Interaksyon,com reported an SWS Mobile Survey conducted on April 13 and 14, which showed the simple widow overtaking the son of a fallen dictator. In the mobile survey which was done after the vice presidential debate, Robredo scored 30%, followed by Marcos 27% and Chiz Escudero at 25%. Alan Peter Cayetano's number was almost unchanged at 13% while Trillanes only got 3% and Honasan, 1%. Will other surveys also show Robredo in the lead? We have yet to see those. There are lots of efforts now from various sectors to block the popularity of Marcos among the electorate. Most recent among these is the joining together of two rival University of the Philippines student political parties during the Marcos regime, namely Samasa and Tugon. Both parties are calling on UP alumni to oppose the VP bid of Marcos. Their battlecry? "Never Again!" Meanwhile, more and more celebrities are pledging their support to the new widow in yellow. Sharon Cuneta, Dingdong Dantes, Agot Isidro, Bea Binene, and a host of others, said that Leni is their VP. There are only 23 days to go before the May 9 elections. 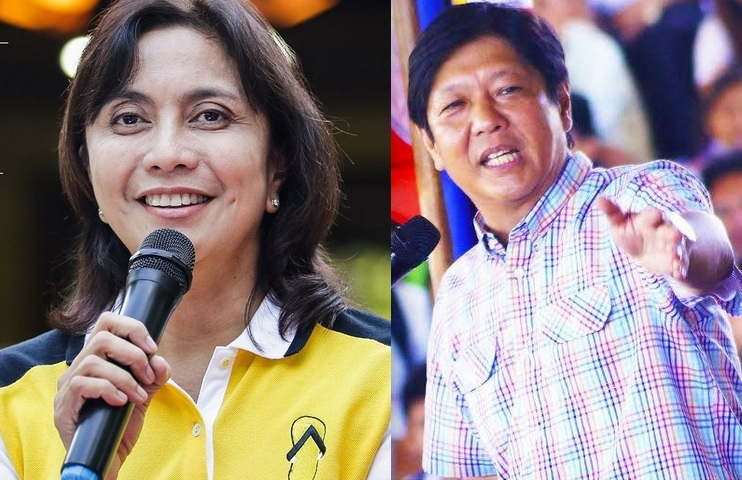 Will the widow Leni win against the still influential son of the former President Marcos? We will know the answer in less than a month.